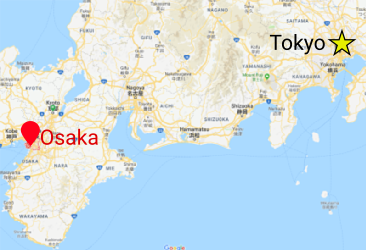 Osaka is about 400km southwest of Tokyo. Osaka was a beautiful city but as Shyla says, it feels very much like Tokyo. When I visited Europe last year, this was one of the problems I had when I visited cities like London, they felt too, commercial? Too, similar to big cities back home. I had a similar feeling when visiting Osaka. When I went to Europe last summer and visited Cork and London I preferred Cork, because it felt less commercial. To me, London could be any big city you visit. Cork felt like it had more character. 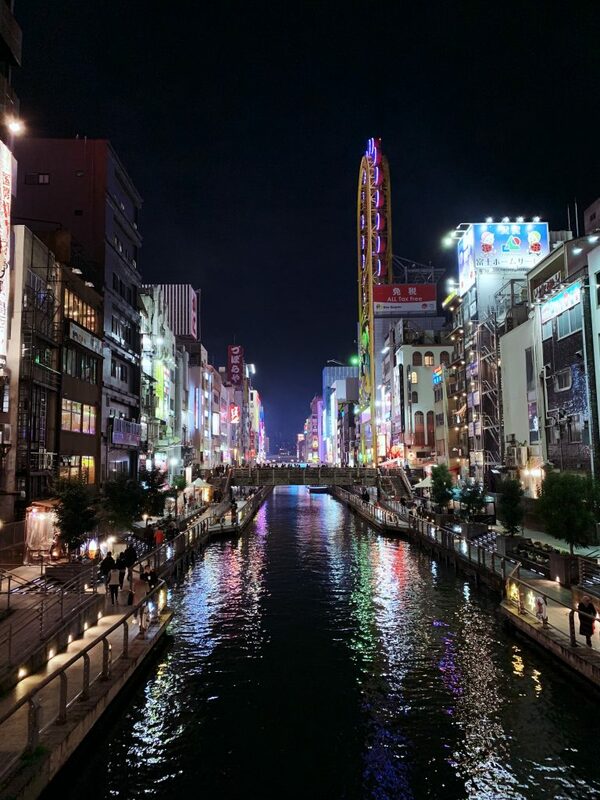 I’m not implying that one place DOES have more character over another (that isn’t what I’m saying about Osaka) but I have to agree with Shyla, it felt very Tokyo-esque. The beautiful city of Osaka reflected in the river that runs through it. We arrived in Osaka and we found our hotel. We have been doing really well with hotels, largely because of Shyla’s ability to research stuff beforehand. She has been picking hotels near transit stations. This makes getting around so much easier because neither of us is driving in Japan. 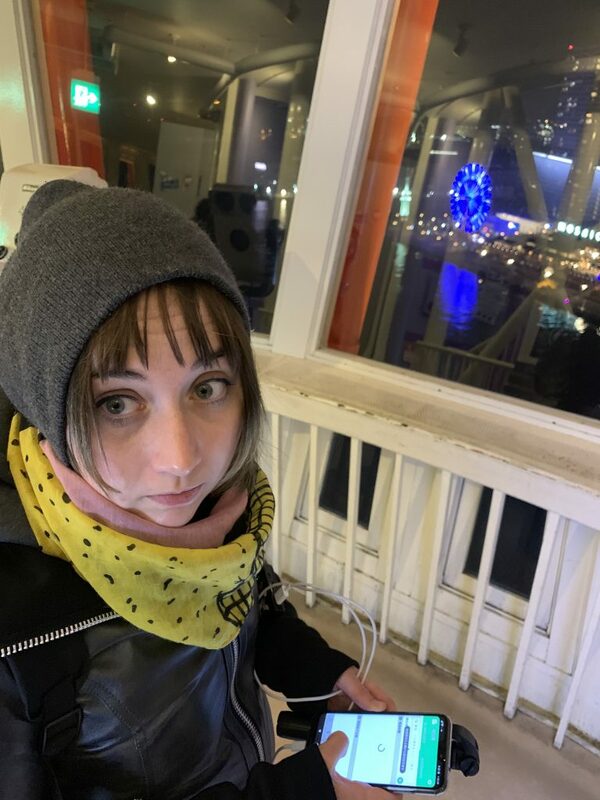 I considered getting my International Drivers Permit but decided against it, besides, it was mostly just to drive go-karts around the city of Tokyo. 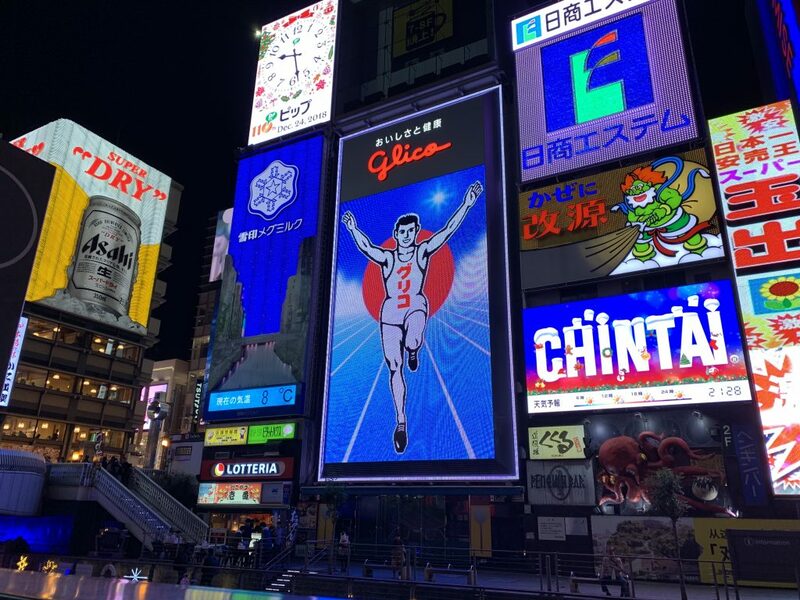 Our first night was pretty quiet, except we decided to walk down to The Glico Running Man, a giant LED display in the heart of Osaka. It was a great sight to see but it was so busy! The shopping district was crazy. I saw so many people with luggage and they were wheeling it around in streets so full of people. I thought they were crazy to bring their luggage right from the airport or train station to this crowded area of the city. That was until I discovered a few days later that people brought these suitcases to fill with purchases they made in the shopping district, I mean these were full sized suitcases FULL of stuff! 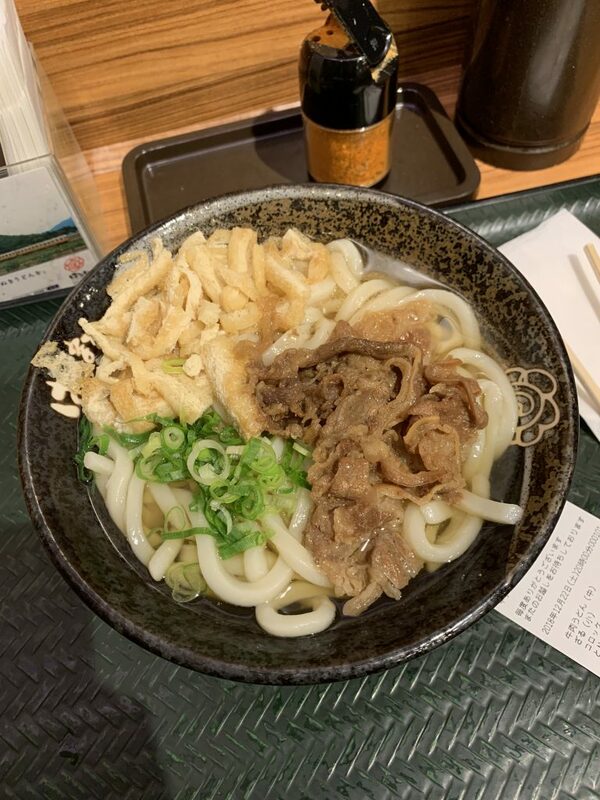 We decided to grab some udon, checked out a few shops, picked up some snacks, and called it an early night. 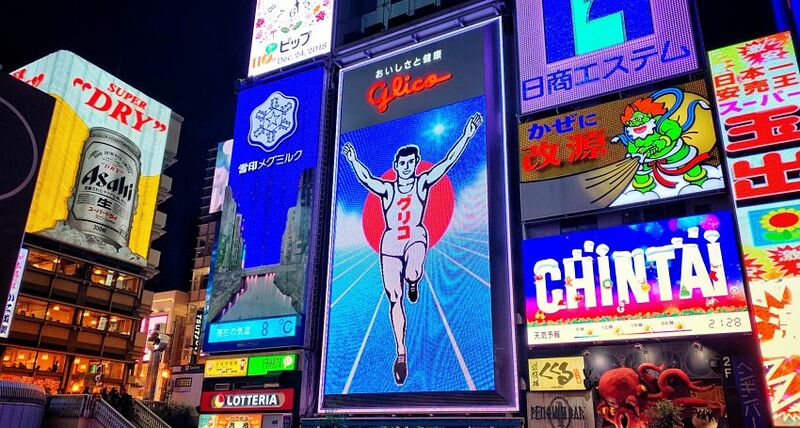 The Glico Running Man, a famous sign in Osaka. 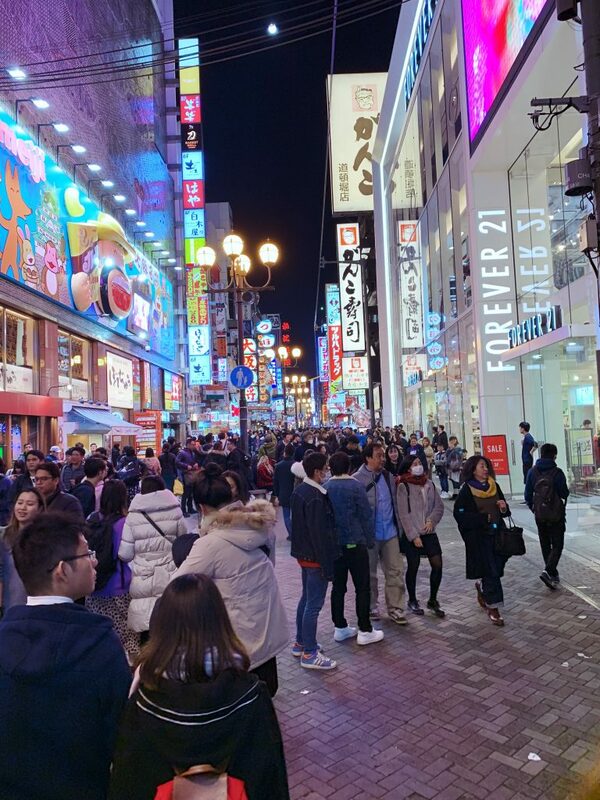 Busy Osaka street with lots of street food. The full album of our final day in Hiroshima and first night in Osaka can be found here. Our first real “full day” in Osaka wasn’t even spent in Osaka. We took a train ride outside of the city to Himeji and Kobe. 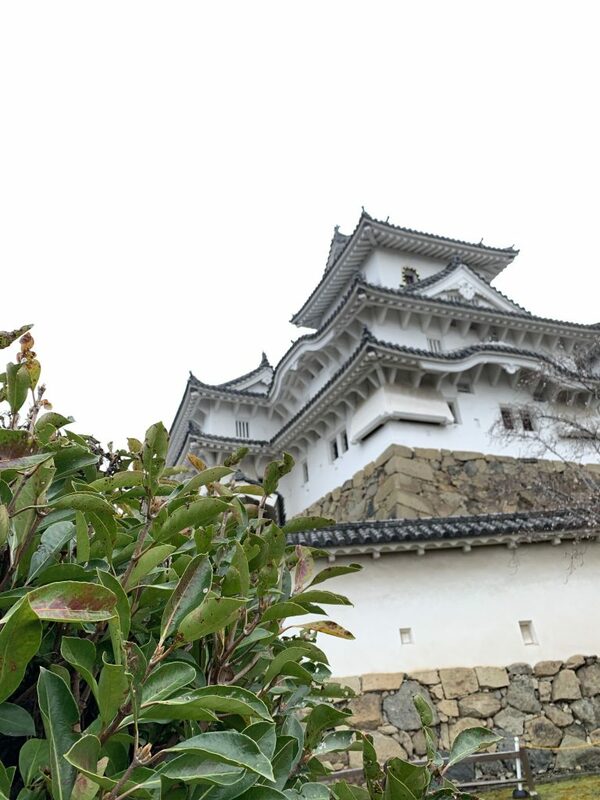 In Himeji, we went to see Himeji Castle, a stunning white castle (my phone keeps trying to get me to capitalize White Castle like the popular American fast food chain made popular by the film Herold and Kumar Go to White Castle). Anyways, it was a beautiful castle and the interior was so cool. Everything was wood and it was so big. We had to take our shoes off to go inside. We were given slippers to use inside the castle but I realized halfway up the castle I had one large and one small. Himeji Castle about an hour from Osaka. 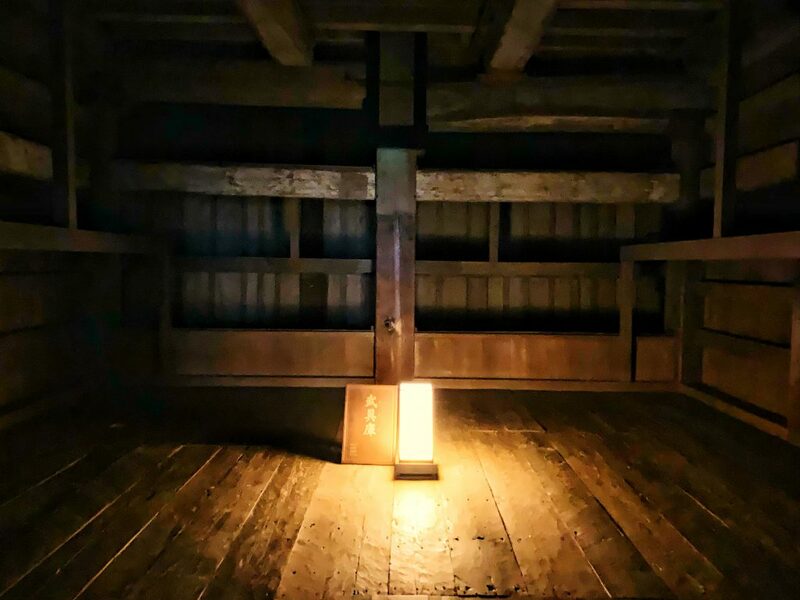 An armoury inside of Himeji Castle. This wouldn’t normally be a problem but going up the steep stairs in the castle in small slippers almost got me killed a few times (almost slipping and falling, no pun intended). So about halfway up I said, “screw it” and took them off to go up the staircases. I wasn’t the only one to approach the stairways with this tactic. 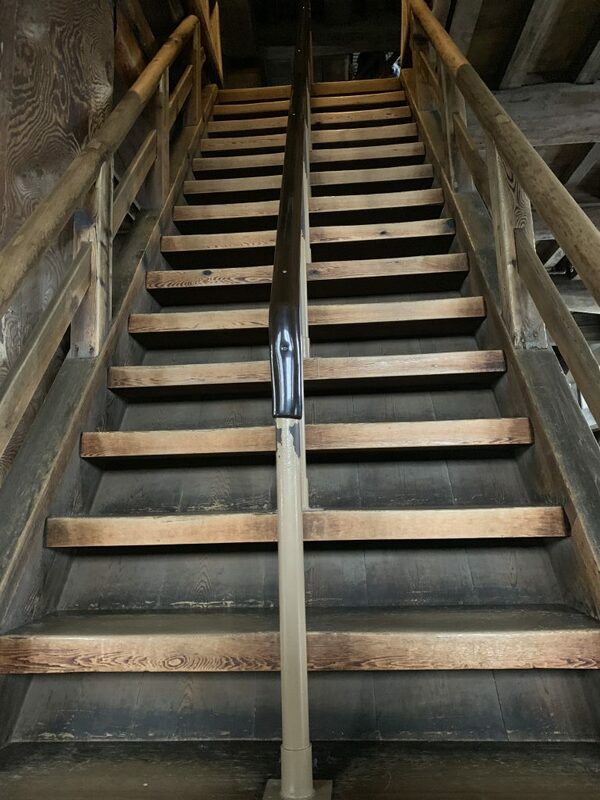 Steep wooden stairs made going up the castle dangerous in the slippers provided. After the castle, we got back on the train and went back to Kobe (we went past it to get to Himeji). We didn’t have a lot of time in Kobe but we visited a gorgeous port attraction called, Harbourland. Harbourland was a bunch of shops, restaurants, and a giant Ferris wheel. 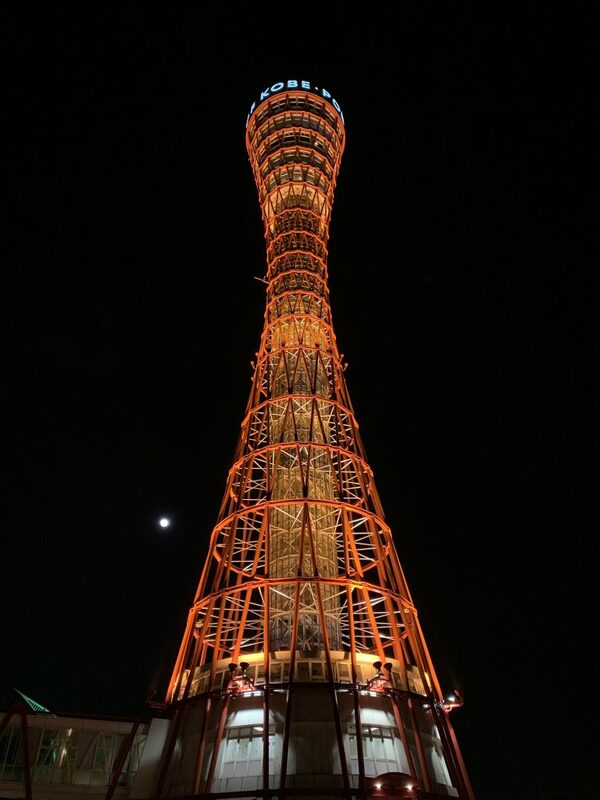 We wandered around, played some Pokémon Go, had dinner, and eventually went up in the Kobe Port Tower to get some excellent nighttime shots of the surrounding area. Originally I didn’t want to go up in the tower but Shyla’s sad face convinced me it was better to keep the navigator of the adventure happy. So we went up. 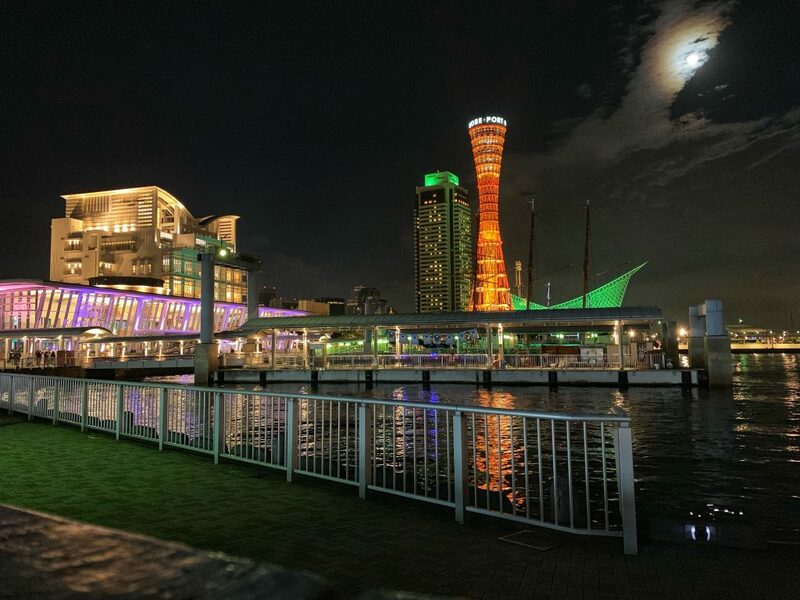 Kobe Harbour, with Kobe Port Tower in bright orange. 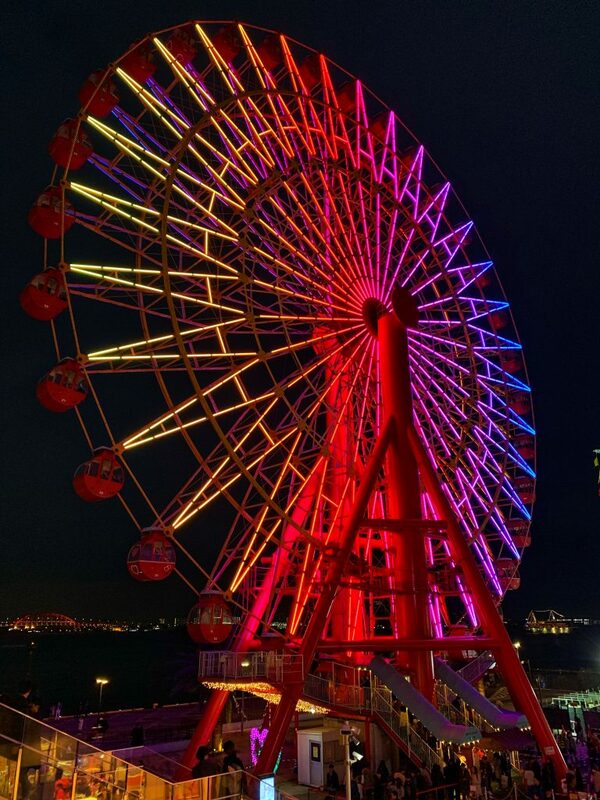 We got some magnificent shots from up in Kobe Port Tower. A full album of Himeji and Kobe can be viewed here. I wasn’t going to include this, but have a BONUS photo of Shyla looking sad because I didn’t want to go up the tower. Sad Shyla because I didn’t want to go up the tower. My bad, there was good fun to be had. Have you ever wanted to live in a world where deer were the main inhabitants? Me neither, but Shyla certainly has. That’s why on our second full day in Osaka we visited Nara. Nara is a short train ride from Osaka, so getting there was a breeze. Immediately stepping off the train and onto the main street you could tell this place was different. Deer ran the show, they literally AND figuratively have people eating out of the palm of their hands. 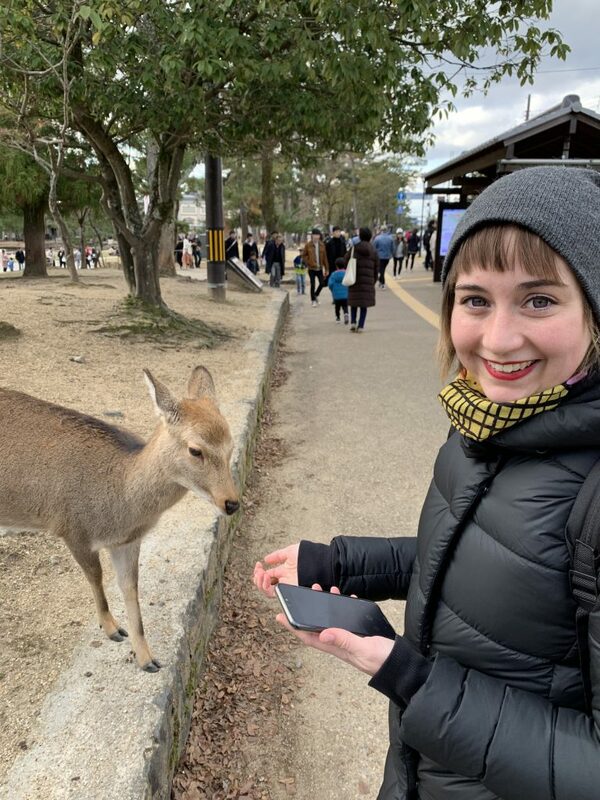 Deer literally eating out of Shyla’s hand. There were deer everywhere. In Nara, deer are considered sacred. From Wikipedia on the topic of Nara deer, “According to local folklore, Sika deer from this area were considered sacred due to a visit from Takemikazuchi-no-Mikoto, one of the four gods of Kasuga Shrine. 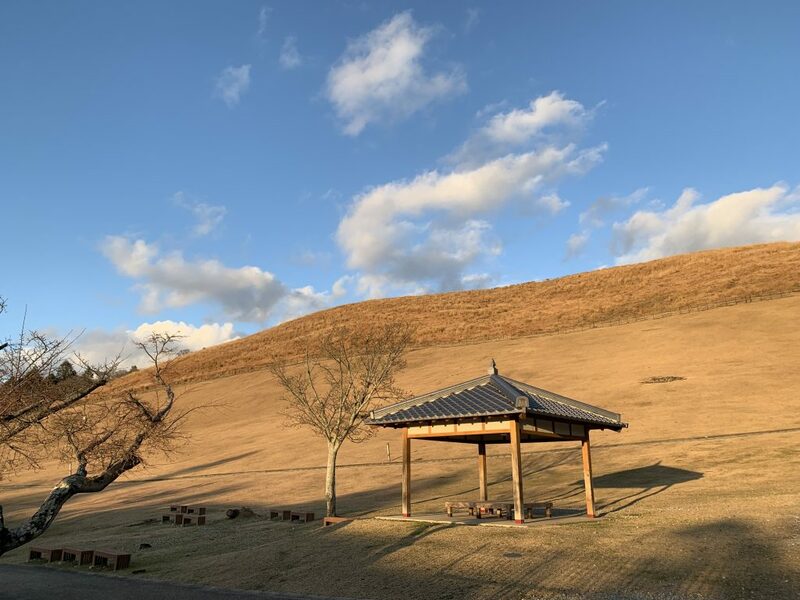 He was said to have been invited from Kashima Shrine in present-day Ibaraki Prefecture and appeared on Mount Mikasa (also known as Mount Wakakusa) riding a white deer” (source). Seeing Shyla so excited to see these deer was an incredible sight (see photo above). I don’t often get this excited about stuff anymore, so seeing this was definitely one of the highlights of the trip. 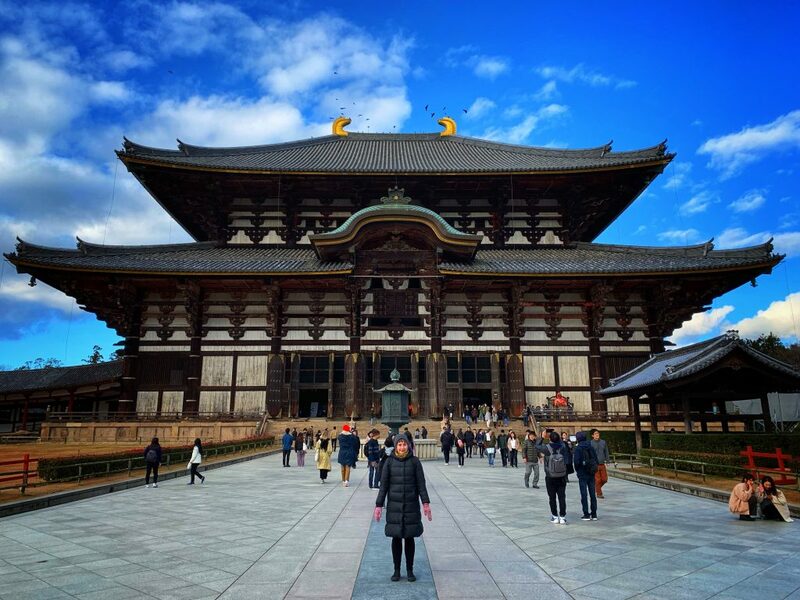 We walked through Nara Park up to Todai-ji, a Buddhist temple where the largest wooden building in the world, houses a 15-metre tall statue of Buddha. 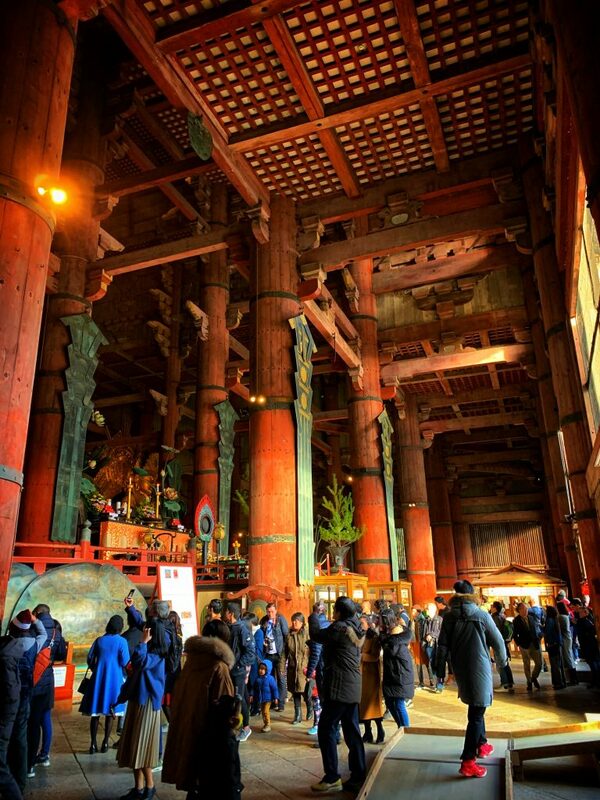 Todai-ji temple was a magnificent sight and I was amazed at the pure size of the building. The photos I took don’t even give you a true sense of the size of the structure. It was massive. As you approach you realize how big the temple truly is. I think I said out loud, “wow, this thing is huge”! Todai-ji Temple, with Shyla in front to show how big this place really is! Inside Todai-ji temple. This photo helps show how big it is. 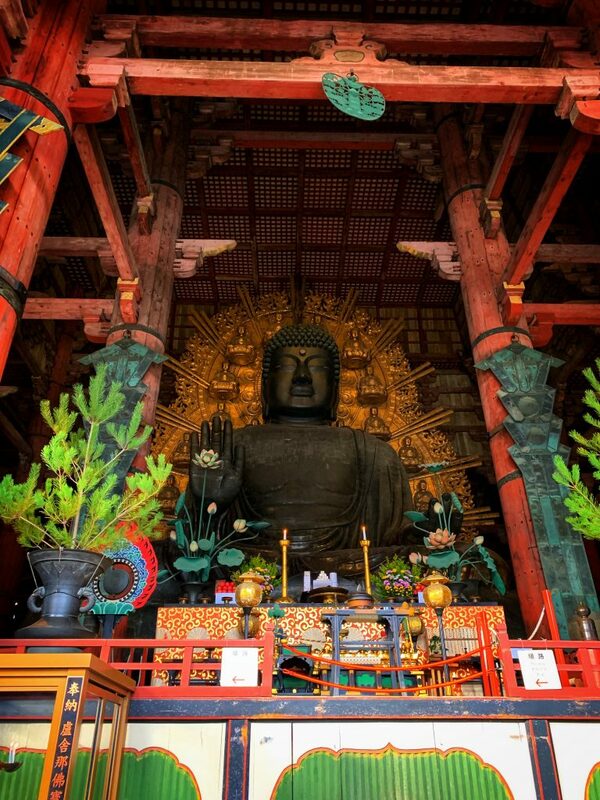 Todai-ji Temple’s huge Buddha statue. After visiting Todai-ji we tried to walk up to Mount Wakakusa, which is said to have one of the top 3 night views in Japan, but apparently, the mountain is closed during the winter months. Probably a good thing, considering the hiking trouble that Shyla and I get into. 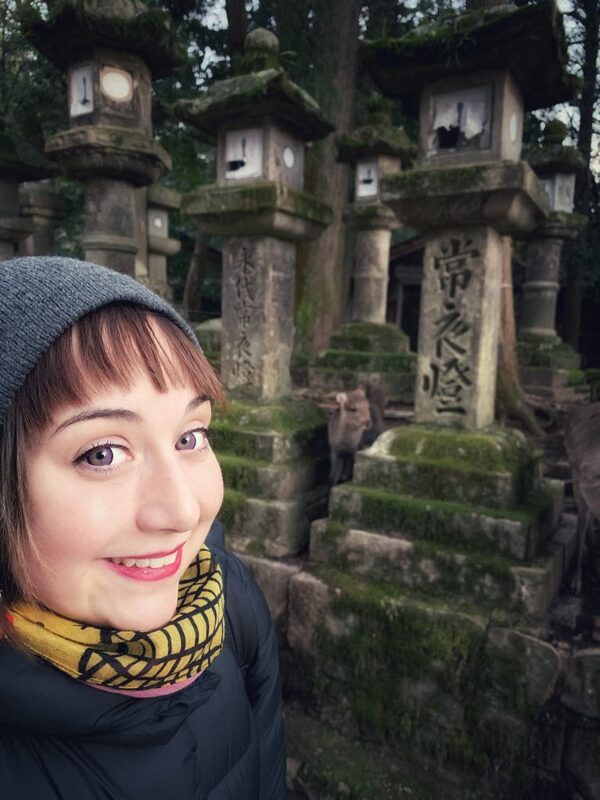 Anyways, not all was lost because we ended up walking into a beautiful part of Nara that we might not have seen had we climbed the mountain and waited until nightfall to get those photos. Instead, we found a shrine with countless lanterns lining the streets. Deer were also all over this area so we got some wonderful photos with them. Shyla was definitely happy with the Nara visit. Mount Wakakusa, closed for the season. 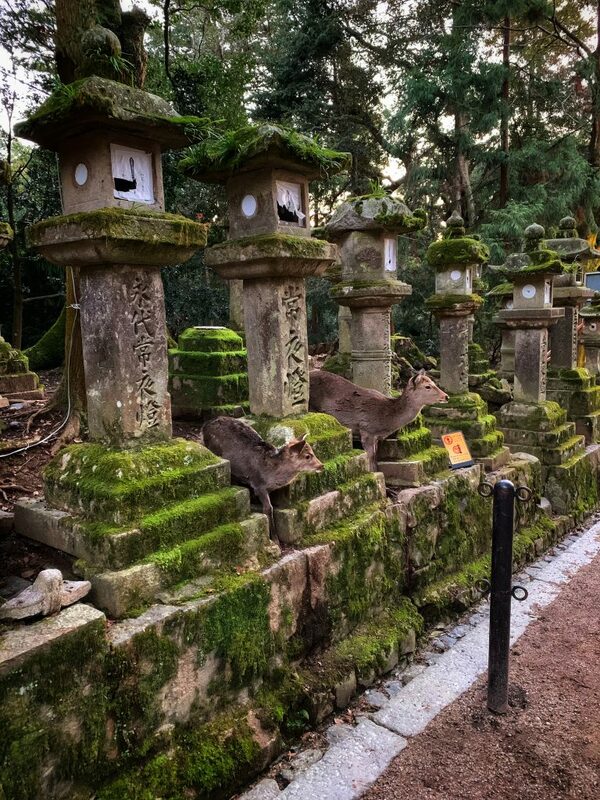 These deer playing amongst the lanterns. Shyla is having fun with the deer…almost too much fun. 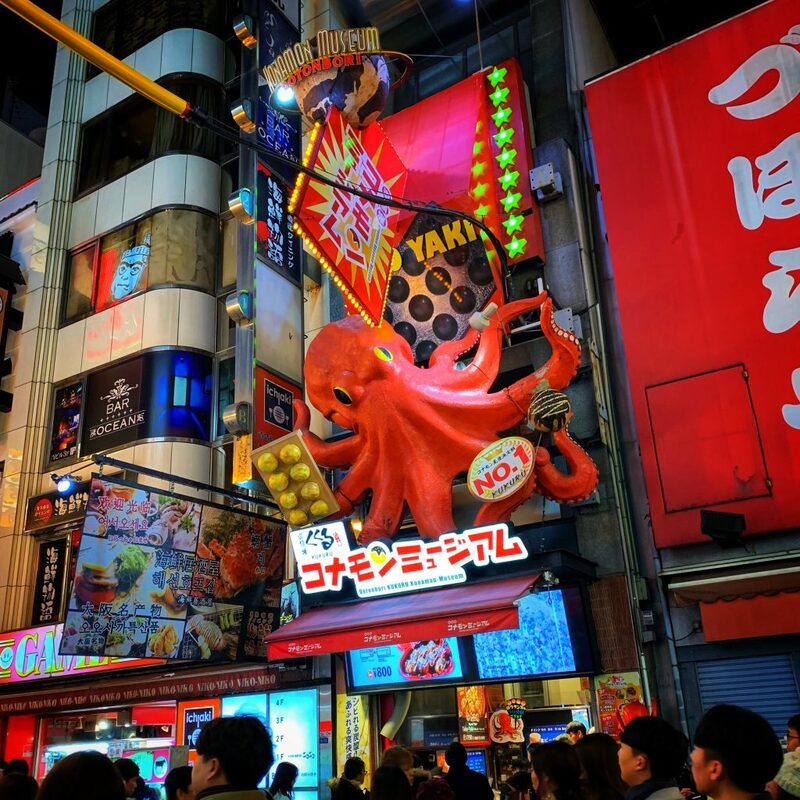 After Nara, we made our way back to Osaka and enjoyed some of the street food that was available in the area with The Glico Running Man that we walked around on our first night in the city. One of the things that were noticeable was the restaurant signs. 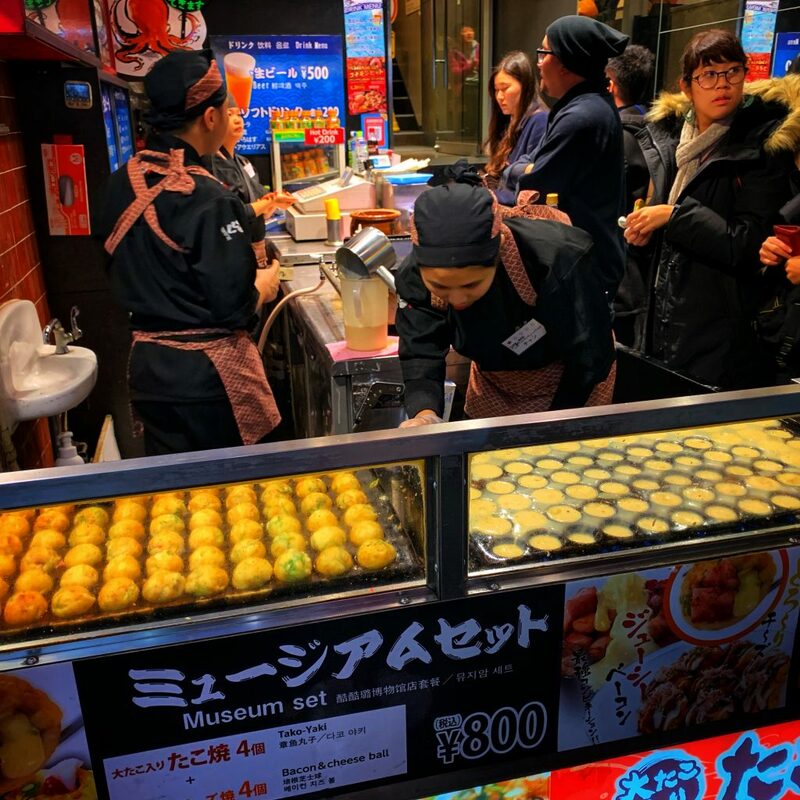 Our first stop was a Takoyaki restaurant (octopus balls). There was a huge vibrant sign above the shop, and they weren’t the only ones that put this much detail in their sign. They were everywhere, giant crabs, giant dragons, and giant puffer fish were just some notable others. Takoyaki Restaurant, the signs in Osaka were incredible. Cooking the Takoyaki, it was a cool sight. 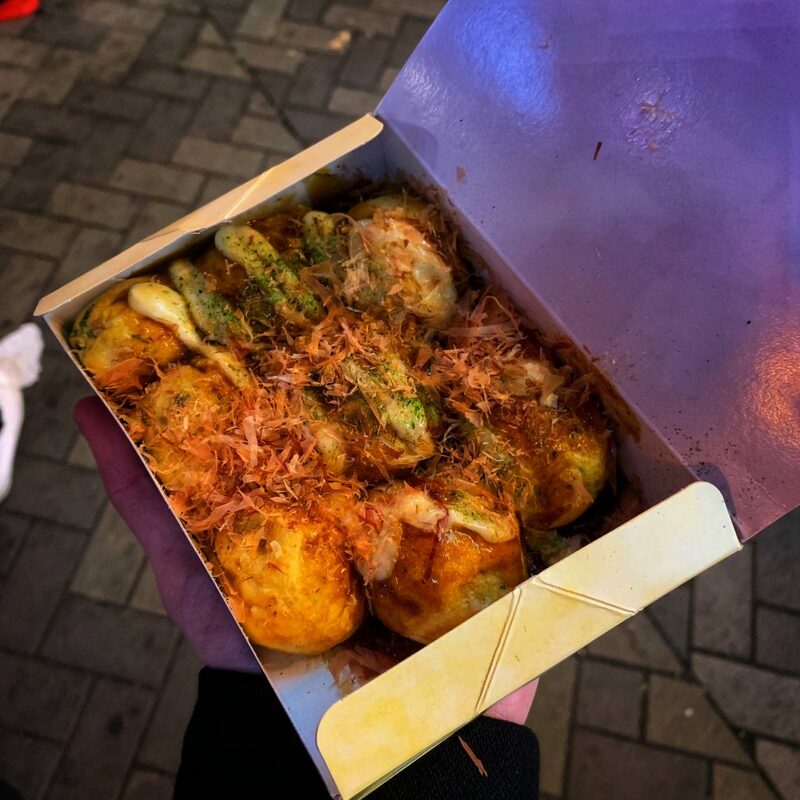 Our 8 Takoyaki octopus balls. The street food was delicious. It was a great way to spend Christmas Eve in Japan. I posted this to social media, but enjoy this Christmas “Card” from Nara. 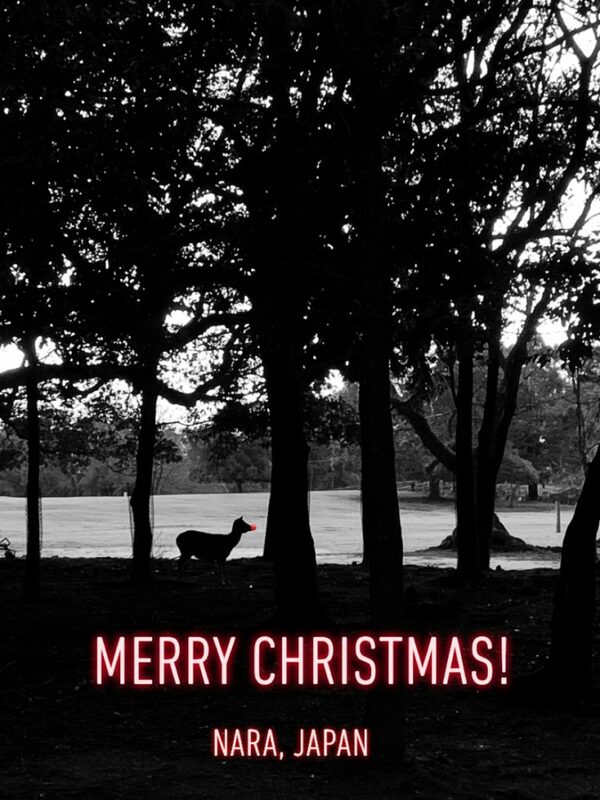 This silhouette photo taken in Nara Park made into a Christmas card. For a full album of our visit to Nara please check it out here. We spent Christmas Day in Osaka. We were pretty exhausted so we had a late start to the day. Since Christmas is not a holiday in Japan we were able to visit the Osaka Pokémon Center in the downtown area. That’s right, we are nerds. 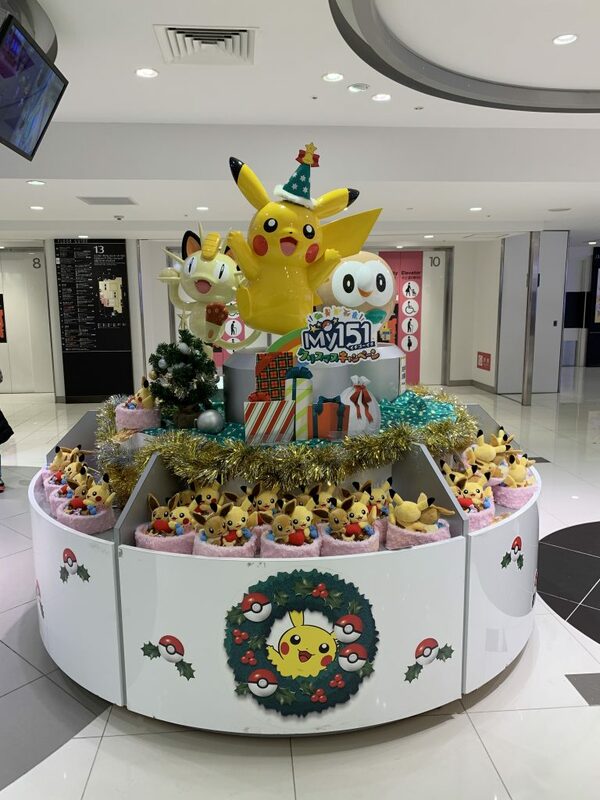 Osaka Pokémon Center, decorated for Christmas. We also managed to find a German Christmas market, which is funny. 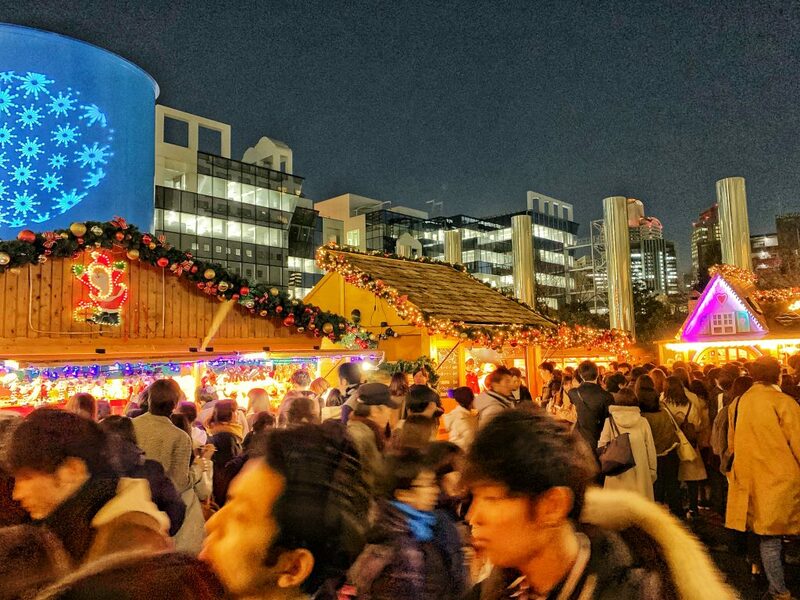 We are in Japan but go to a German Christmas market. I just wanted to see Christmas lights so mission accomplished. It was so busy here so we didn’t stick around long. 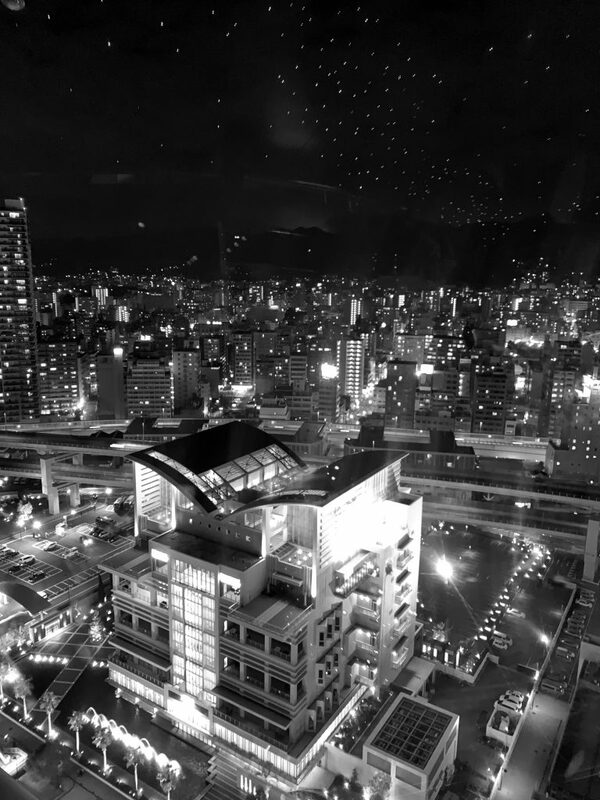 The market was located under the Umeda Sky Building, so it was a beautiful view. We didn’t go up to the observation deck but it was still something I wanted to see. 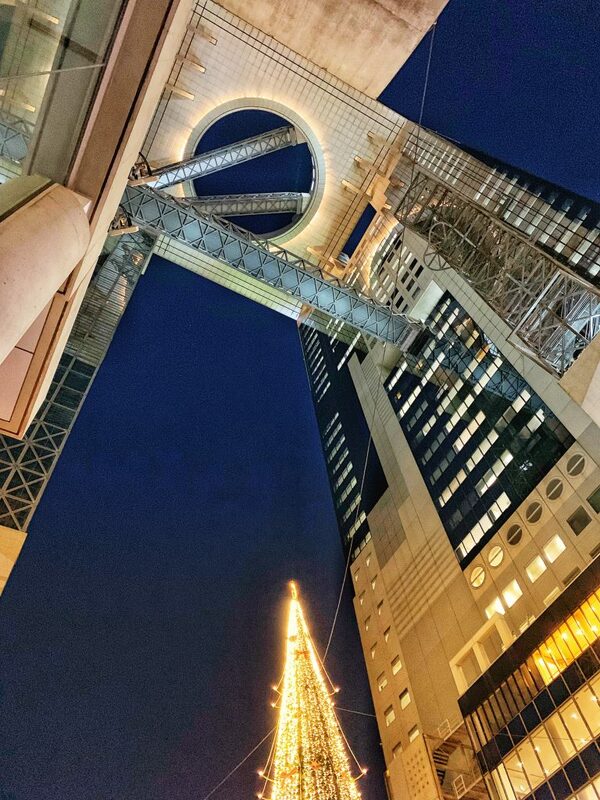 Umeda Sky Building With observation deck. Christmas tree at the center of the German Christmas Market. The crowds of people at the German Christmas Market were pretty big. 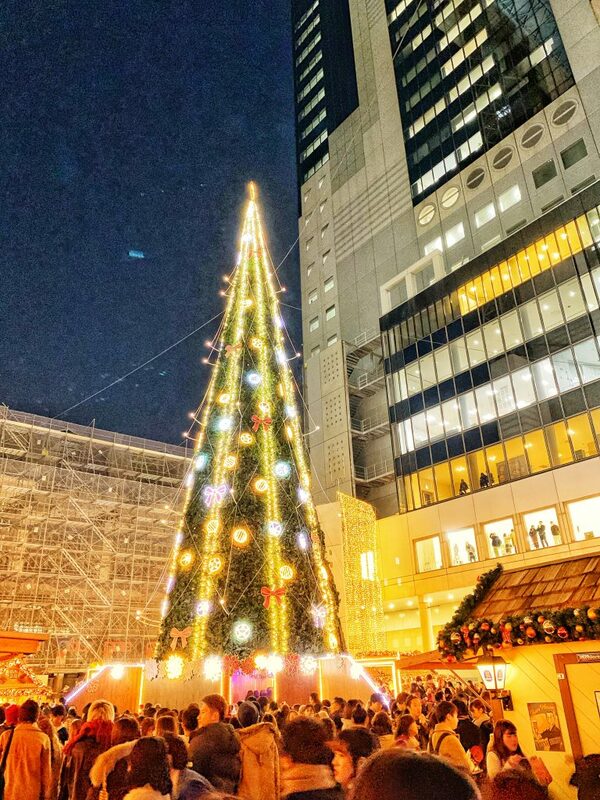 As I mentioned earlier, Christmas in Japan isn’t as big a deal as it is in North America. 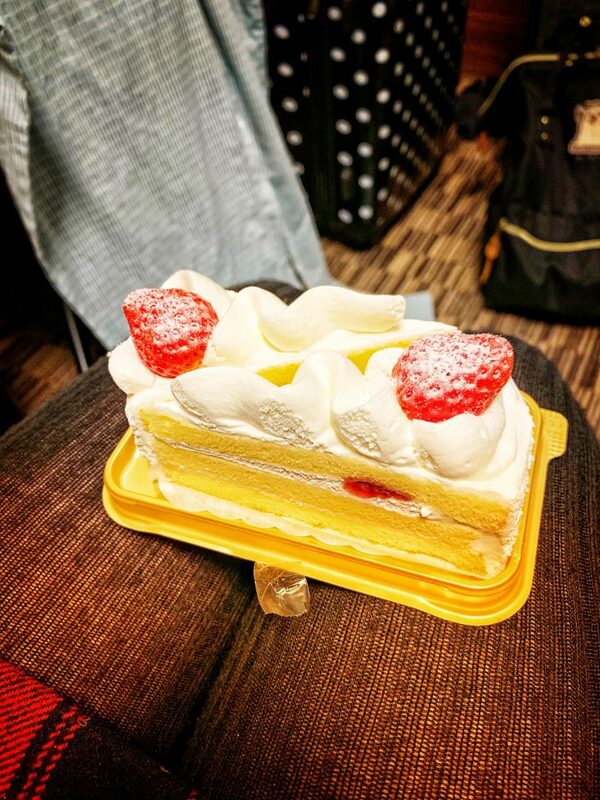 However, Shyla tells me that fried chicken (especially from Kentucky Fried Chicken, KFC) and Christmas cake are particularly popular in Japan. 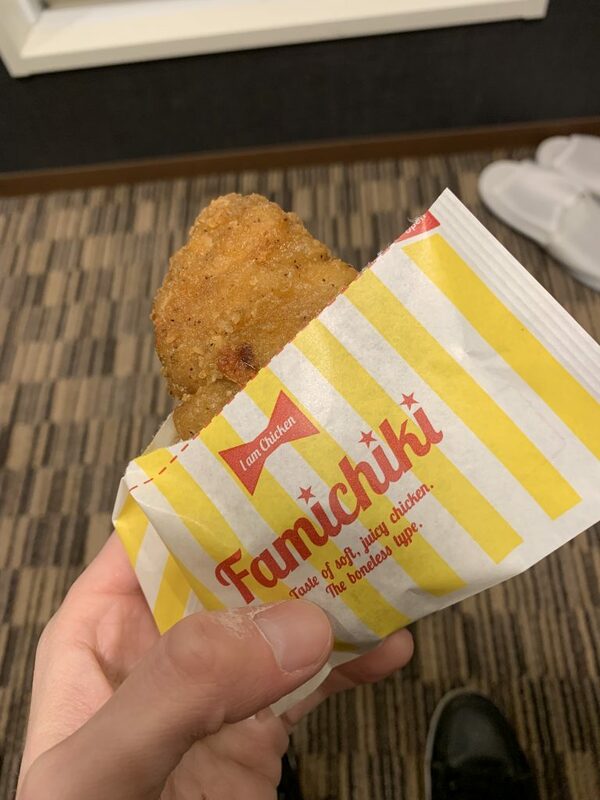 Unfortunately, there were no KFC locations near us, but I did get some fried chicken from the 7 Eleven near our hotel. Also, before people complain about 7 Eleven, I want to say that Japanese convenience stores are SO MUCH better than they are in North America. I’m going to put together a post about Japanese convenience stores at some point so I won’t say much about it now, but my god, they are delicious. We also had Christmas cake too. Yum! Kentucky Fried Chicken is big on Christmas in Japan, we didn’t have one close to us so here is my 7 Eleven chicken. 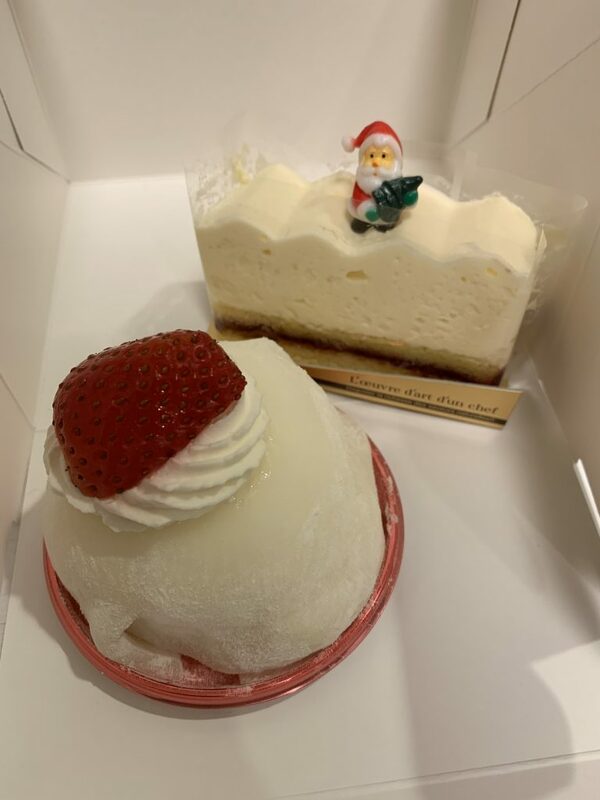 Rare cheese cake (back) and a Mochi like cake (front). Anyways, Christmas in Japan was interesting. I’ll admit it didn’t feel very Christmas-y but it was an experience nonetheless. Coordinating calls to back home also meant phoning in on Christmas morning had to be done in our evening. I this contributed to why it didn’t feel like Christmas. I got to spend Christmas with Shyla though so it felt like I had family with me, even 10,000 km from home. The Festival of Lights was on in Osaka so we did see some incredible illuminations while in the city. 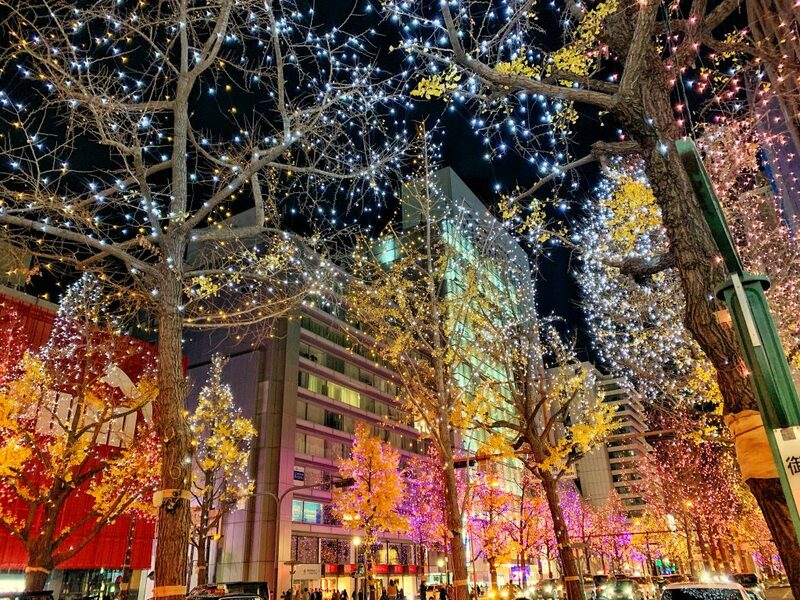 We happened to see the Midosuji Illumination, a 4 km stretch of road with trees decorated with Christmas lights. For a full album of our Christmas day in Osaka please check out the album here (again, it’s smaller than all our other albums). Here is one of the photos we took from the Festival of Lights. Midosuji Illumination, part of Osaka’s Festival of Lights display. On our last day in Osaka was spent visiting another castle. This one requires us to climb up to the 8th floor and work our way down from there. Unlike most, we took the stairs. It was a shorter line (none) and we got our steps in for the day, yay! Again, the views of the city were amazing. I didn’t take many from the top but I did take some from the ground level. I loved the green roof of Osaka Castle and the golden tigers that can be seen on the upper levels. Osaka Castle, you can see the golden tigers at the top of the castle. There was also a very interesting time capsule kept in front of the castle. 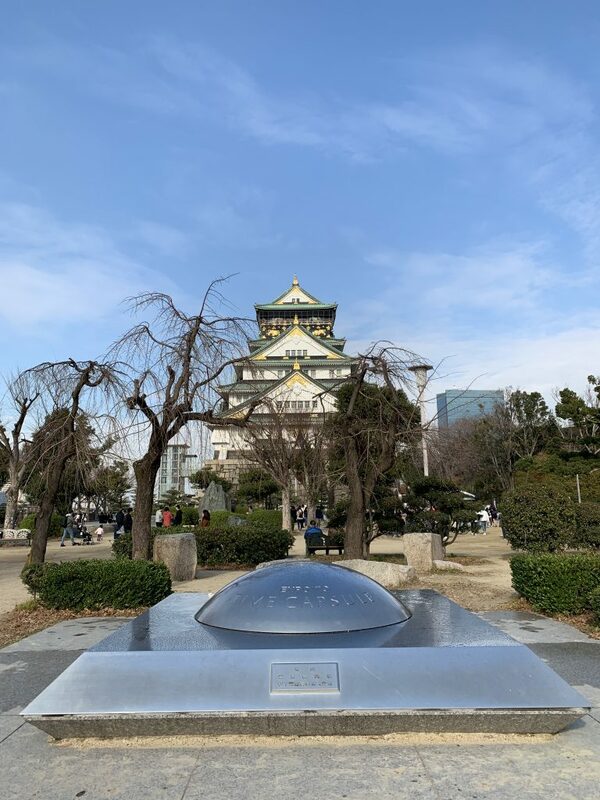 This time capsule in front of Osaka Castle has two sections. The upper portion is opened at the beginning of each century, while the lower portion won’t be opened until the year 6970! 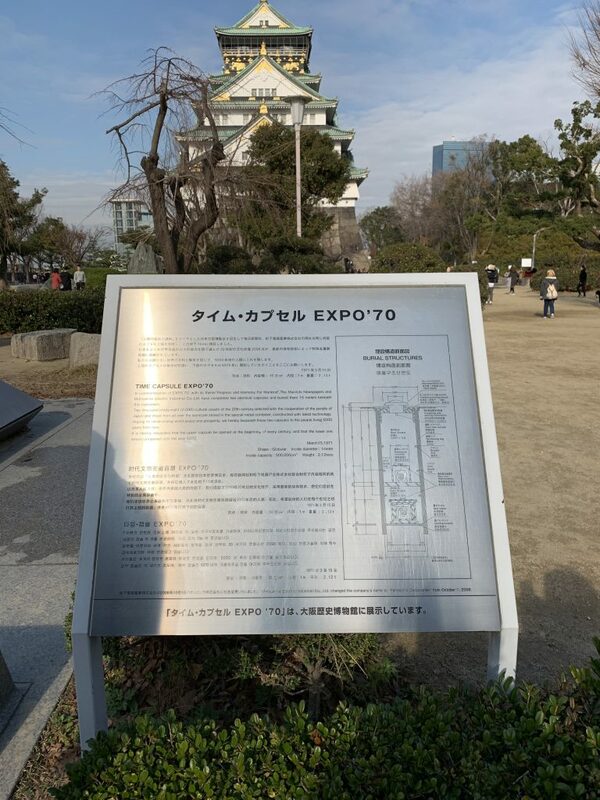 Futuristic (for the ’50s) time capsule at Osaka Castle. Write up about the time capsule (with diagram). Will mankind even be around until then? Who knows, but be sure to tune in next week and see! Check out the write up that was beside the time capsule for a full description of it. For a full photo album of our last day in Osaka, check it out here. 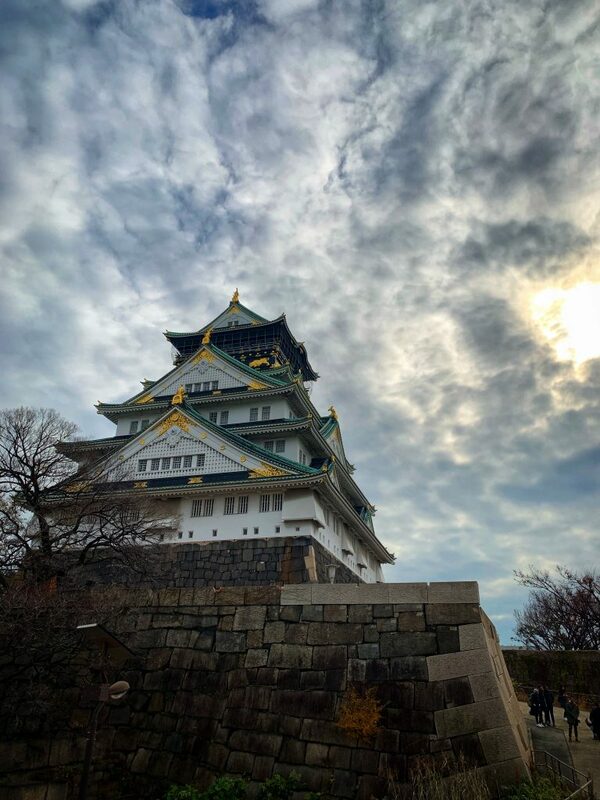 Osaka Castle was the last point on our Osaka Adventure, so we boarded a train (not a bullet train) and headed to our next destination, Fukui. Dinosaurs await us in Fukui Prefecture.